It's so crazy when i look in my room and realise i haven't even shared some amazing hair accessories with you guys! 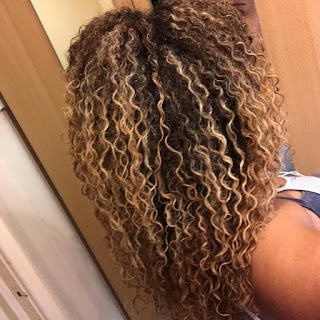 I share my products and hair tips all the time, but what makes a great style working doesn't just come down to this, it is the tools that come with it! One of the most important ones being, the correct hair towel! Standard hair towels are a no for curly hair. They create friction, which turns into frizz. Even just plopping your hair in one of these towels is going to make the desired results more difficult. I have used micro fibre hair towels in the past, which do work brilliantly. 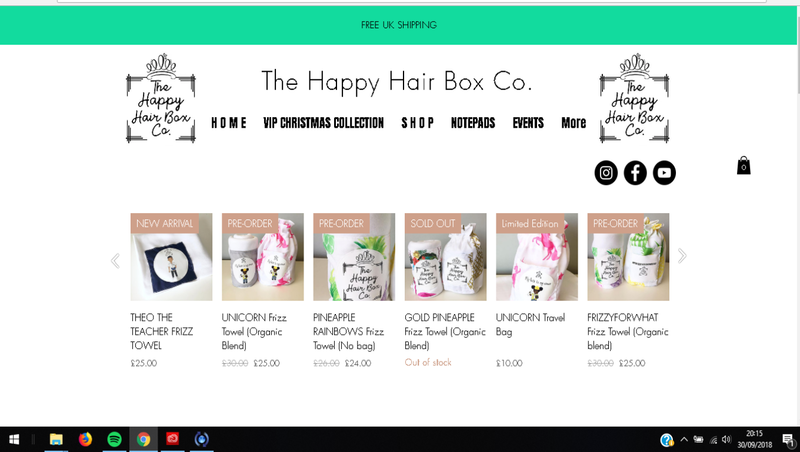 Then i came across The happy hair box and it has been a complete game changer! 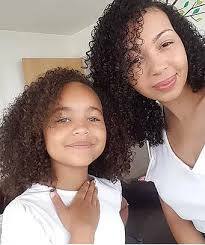 This is a UK mother and daughter duo who you absolutely MUST follow and keep and eye on! Jaya has all the confidence and hair knowledge of someone older than her years, and her mother Sacha knows exactly how to care for both high porosity hair like hers, and low porosity like Jaya (and me). 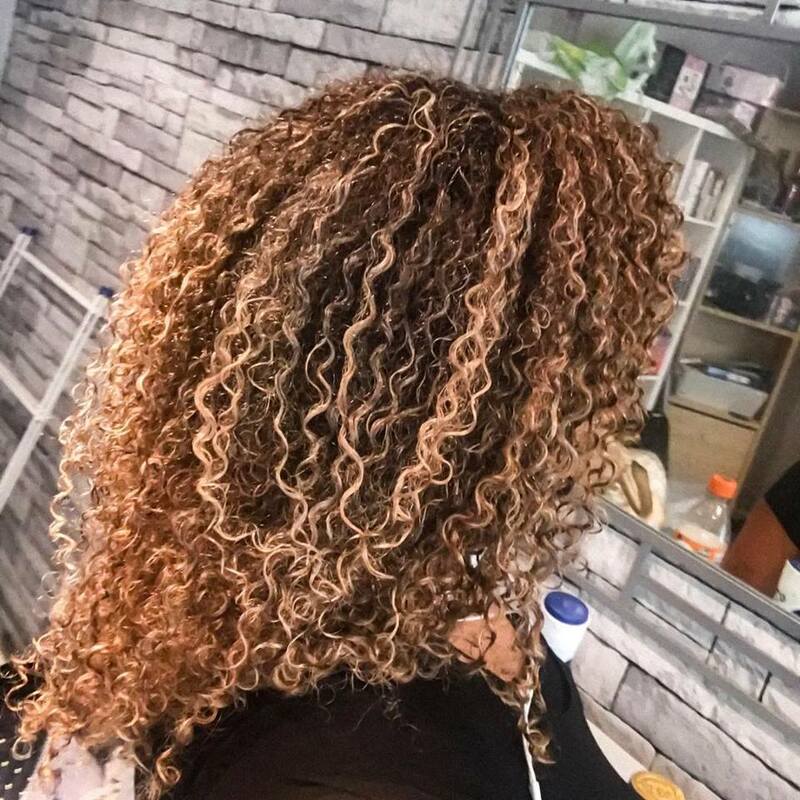 Sacha is an inspiring woman who not only wants to help teach kids that they can be whoever they want, dads how to do their daughters hair with her 'Daddy and Daughter hair workshops', but also an inspiration for young and single mothers out there. The bond these two share is a beautiful thing to watch online, and their videos never fail to make you smile. Jaya is going to be an absolute star! I have followed them online for a while and thought that the accessories they do for children are the cutest, and then i saw the hair towel. Unlike the microfibre ones i have used before, this towel is made from bamboo extract and organic cotton. A lot of people choose to use old cotton t-shirts for their hair because it stops the frizz, and that's exactly what these towels are like. 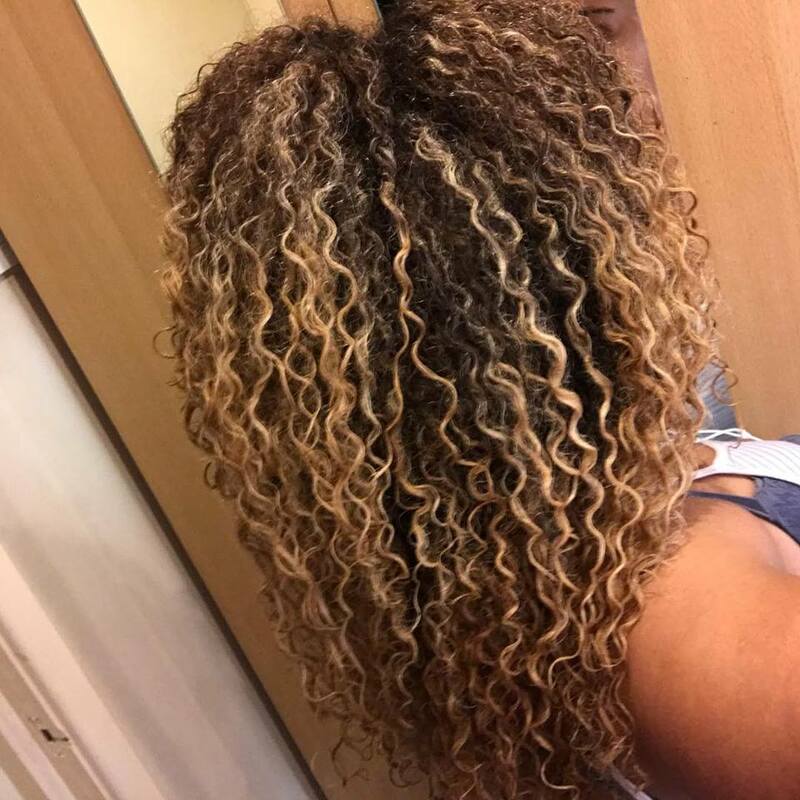 The material feels soft and gentle, and it soaks up excess water and product without drying out your hair. They come in various designs and these designs are always being updated and changed so there is a wide selection to choose from. Some of the designs come with a waterproof bag making them perfect for taking to the pool and on holiday! I didn't expect to be as blow away by these towels as i actually was. It doesn't feel like i am using a towel at all, yet my hair is dry. My favourite way to use the towel is to plop my wet hair while i continue doing my makeup in the mornings. It means i don't have to leave with wet hair, or worry about frizz. I can just leave it up there doing it's thing off my neck and out my way. The happy hairbox started with storage boxes for products for your little ones to store all their stuff in, with cute little characters with aspiring careers. From doctors to astronauts these characters are in roles young girls and boys can look up to. They come with names too and now the brand are offering customised ones for Christmas presents! Since the hair towels have been out, there have been more and more products being added to the website and it grows every month! From satin scrunchies, to shower caps, notepads, colouring books, and even a spray bottle. The characters created are all different from black, ginger and wearing a Hijab, to make sure that everyone feels represented. I think that is one of the most important things that they are trying to get across and to promote. My favourite product from them, has got to be the reversible satin hair bonnet! I am all about bedtime curl protection! In the past, hair bonnets i have used have been pointless. They either don't stay on my head, leave a mark on my forehead, or make no difference to my curls in the morning at all. This one was different. The first thing i noticed was the size of it. It is huge! The website says it is 23inches! I have a lot of hair, and i think that has been my issue with bonnets in the past. This one fits all of my hair in, and still has room! It is reversible and comes in purple and gold and they also do kids sizes which are 21 inches. 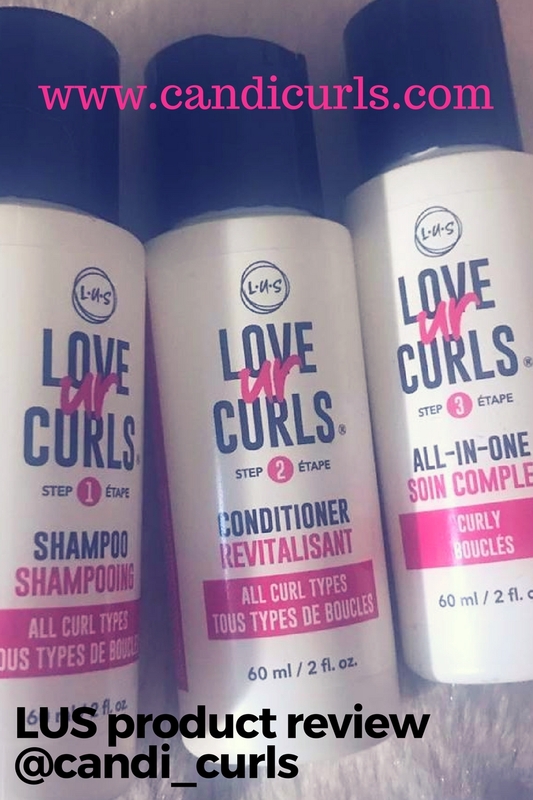 The soft satin really does ensure that your hair isn't getting any friction which while you sleep, and all it requires in the morning is a gentle shake and your curls are left perfect. I ALWAYS use this bonnet on wash day because i tend to go to sleep with my hair damp. I hate the feeling of damp pillow, satin or not, on my face and so this is great for that. It was also perfect during the hotter nights over summer, when i needed my hair away from me. Tie your hair into a pineapple and then slip this bonnet on and adjust to a way that feels comfortable. I have had this bonnet since July and not once has it slipped off my head, or left me unhappy in the morning. I can not recommend this enough! 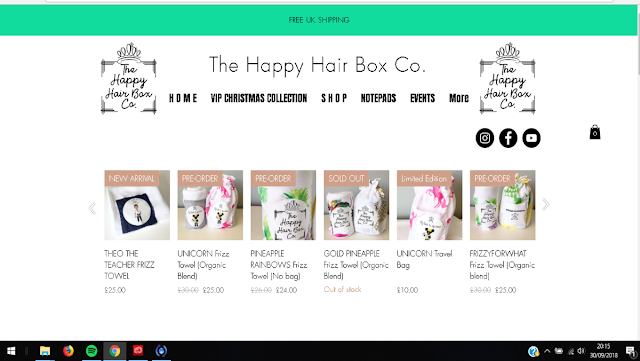 Please do check out The happy Hairbox and give the girls a follow on instagram @thehappyhairbox they really are a joy to follow and a duo to watch as they continue to expand. The happy hair box frizz towels start from £24 and the bonnets are £14-16.